A man allegedly tied to a gang and who was left clinging to life after a gang-style shooting at a Langley, B.C., mall Friday has died. Kevin Robert LeClair, 26, died in hospital, RCMP said in a release. 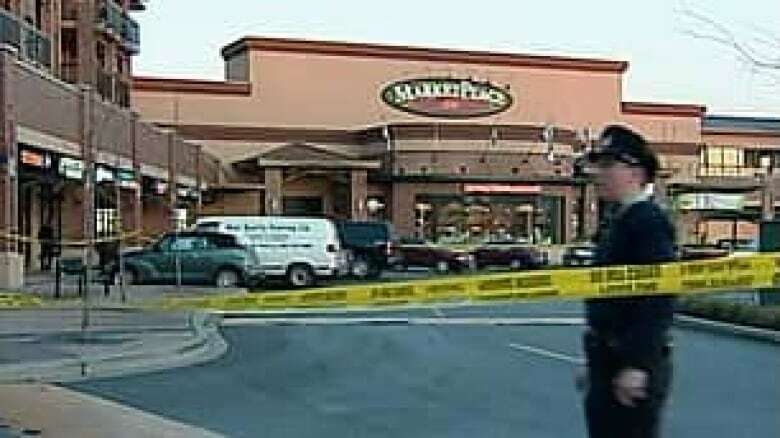 He was injured after two gunmen opened fire on a pickup truck at a Metro Vancouver shopping mall on Friday afternoon. Police say the shooters got away in another vehicle nearby. The Surrey resident is allegedly an associate of known gang members in the Lower Mainland, including the notorious Bacon brothers. "We can't guarantee this isn't going to happen again. We can be hopeful that it's not, [but] all we can do is try to stay ahead of it," said RCMP Cpl. Peter Theissen on Saturday. It was the fifth case of gun violence in the Lower Mainland since Monday, but police won't say if any of the incidents are linked. "Is there some kind of gang war going on right now? Certainly looks like it on the surface, [but] right now I can tell you we have not linked any files in the last week to each other, and that we haven't established if one is a retaliatory attack on another," said Cpl. Dale Carr of the Lower Mainland's Integrated Homicide Investigation Team. Police have confirmed three of the shootings were targeted attacks, although investigators have not identified any suspects. Meanwhile, one local criminologist said gun violence in British Columbia is getting worse. The number of gangs in B.C. has doubled in the past two years, said Darryl Plecas, a University of the Fraser Valley professor. He said there are more than 100 gangs operating in the province at any given time. "It's really quite disturbing when we have so many people who are well-known, established gangster types on the street and those people are facing gun charges and released on bail," Plecas said. "I think, that kind of activity, we really have to give some second thinking to it." That's something the family of an innocent victim killed by gang gunfire in 2007 wants lawmakers to consider. Steve Brown's brother-in-law, fireplace repairman Edward Schellenberg, was one of two innocent victims killed during a 2007 gangland hit in a Surrey highrise. "There's been no changes to the system, [to] the way the provincial government is doing the administration of justice. That is an unbearable outrage for us right now, seeing all this violence," Brown said. He is calling for B.C. Attorney General Wally Oppal to find a solution to the spate of violence in Metro Vancouver within 30 days — or step down. "The madness continues. We just can't fathom how out of control this gang war is and there's no talk from our provincial government to do anything about it other than clichés," Brown said. B.C. 's bail process is to blame in many of the recent killings, he said, because it allows gang members already wanted or awaiting trial to get back out on the streets far too easily.